Looks like you are currently in United States but have requested a page in the Spain site. Would you like to change to the Spain site? ALAN COOPER is a founder of Cooper and a pioneer of modern computing. His groundbreaking work has influenced a generation of programmers, business people, and users. 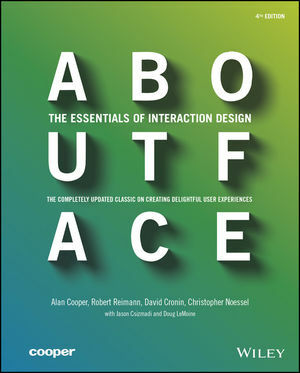 ROBERT REIMANN was founding president of the Interaction Design Association (IxDA). He is Principal Interaction Designer at PatientsLikeMe, and former Director of Design R&D at Cooper. DAVID CRONIN is a Design Director at GE. He was also Director of Interaction Design at Smart Design, and a former Managing Director at Cooper. CHRISTOPHER NOESSEL is Cooper’s first Design Fellow, and the co-author of Make It So. He teaches and speaks about design all over the world.